Mercedes' new G-Class Experience Center to open by year's end. The new G-Class is the most capable off-roader Mercedes has ever made. More capable, at any rate, than you're ever likely to discover on public roads. So if you want to see what it can really do, you'll want to head to the new G-Class Experience Center. The facility is set to open by the end of the year in Kaldsorf, Austria – just a 20 minute drive from the factory in Graz where the G-Wagen is made. Once complete, it will offer visitors the chance to push the vehicle to its considerable limits. The 25-acre site is being developed on the grounds of a former Austrian Air Force base, and will encompass four "test modules,” including both natural and artificial off-road sections, a hill with ramps up to a 100-percent gradient, and an on-road section made from the air base's taxiways. "The new G-Class has even better off-road capabilities than its predecessor. In future, at the new G-Class Experience Center near Graz, customers and fans will be able to find out for themselves that it masters even the most demanding challenges,” said Mercedes-Benz off-road-vehicle chief Dr. Gunnar Güthenke. 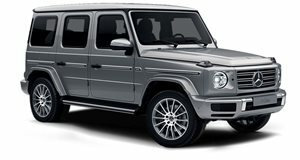 Like its predecessor, the new G-Class is built on Daimler's behalf by Magna Steyr – the same contract manufacturer that also builds E-Pace and I-Pace crossovers for Jaguar, 5 Series sedans and Z4 roadsters for BMW, and Supras for Toyota. It also used to make M-Class crossovers and E-Class sedans and wagons for Mercedes, along with bodies for the SLS AMG and roofs for the SLK.